• -Maximum protection around your body – with low profile! Choose size and Color and the correct price will be shown. Quick Delivery ! -Manufactured and shipped the same day. Used by numerous European & International Police and government agencies, Press & Aid Organizations, Security companies and VIP´s. Your correct Size = 3 - 4 cm larger than the largest area around your belly / stomach in cm. Important ! If you are larger than >up to< measurement in centimeters around the widest part of your belly the vest will NOT overlap correctly and protect you fully. COMBO TAC ™Female model is an exclusive body protection vest designed to provide female users good ballistic and knife protection for vital organs such as heart, lungs, liver, kidneys, spleen and spine while keeping a low profile. Front and back panel overlap on the sides for maximum protection and comfort. The COMBO TAC ™Female model comes designed with adjustable shoulder and U-band™waist straps allowing the vest to be adjusted to almost any body shape or size. 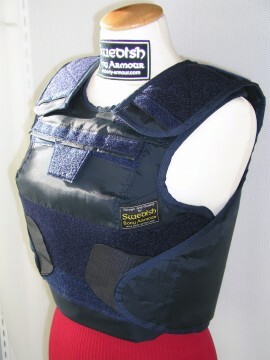 The vest is very easy to put on and comfortable to wear. A COMBO TAC ™Female model in size Large with protection level NIJ II weighs only 1,2 kg! COMBO TAC ™Female model can be upgraded with our SPV-PRO™ internal stab protective panels for higher stab protection levels and add-on Ballistic plates to stop rifle & exotic threats (front and back), side protection panels, genital ballistic and/or cut protection, and Shoulder & Collar Pack that offers optional removable protection for the shoulders and neck. Available in Protection Levels according to NIJ STD II, IIIA, IIIA+ as well as German, Swedish and British HOSDB/Home Office Ballistic/Stab/Splinter Protection levels. • -10 years warranty on the protection level -void if abused, see our terms . • -100% satisfied customer warranty. COMBO TAC ™Female model can be tailor made if necessary to fulfil customer’s requests for female special sizes. - Good fit is important for comfort and safety! • -Lifetime international repair warranty on ballistic panels. • -10 years warranty on service and the availability of replacement components. • -Free of charge adjustment after purchase.